He wasn’t the best known name on the bill, but blues rock guitarist Kris Barras summed up the PKD Festival best as he took to the Dalgety Bay stage late on Saturday afternoon with his blend of soul-wrenching melodies that has recently seen him reach number two in the blues chart. “If you’d said to me six months ago that I’d be taking to a stage on the same bill as S Club 7 and boyband 911, I’d have said you were having a laugh!” the tattooed Torquay-based musician declared between foot-stomping riffs and catchy tunes. 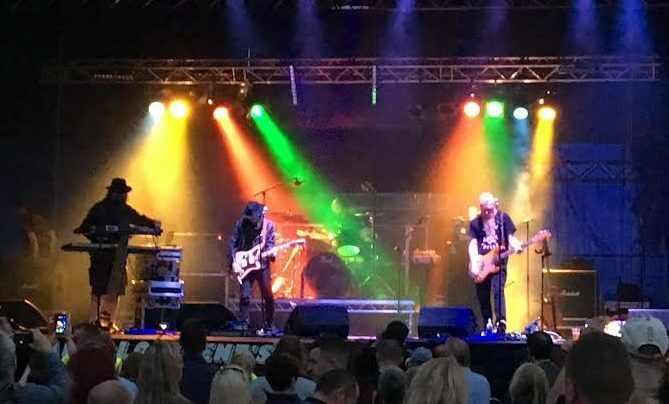 It was a sentiment shared by many in the several hundred strong crowd at Dalgety Bay Sports Centre who couldn’t quite believe they were watching such an eclectic line-up. Many had simply been drawn by the prospect of seeing the headliners – 1990s Scouse indie band Space. But the journey towards Tommy Scott’s band was to be an entertaining one with the crowds at this family-friendly festival making sure they enjoyed themselves – and remaining grateful that the forecast rain never quite materialised. There might only be two of the original S Club 7 line-up performing these days, but Bradley McIntosh and Jo O’Meara proved there ‘Ain’t no party like an S Club party’ and dare I say it, were good value in a pop-folkoric legend kind of way as they took to the stage mid-afternoon. The surreality continued straight after with a set by 1990s boyband 911 who did their best to defy the years with some dance moves that at times looked like they might do themselves an injury. 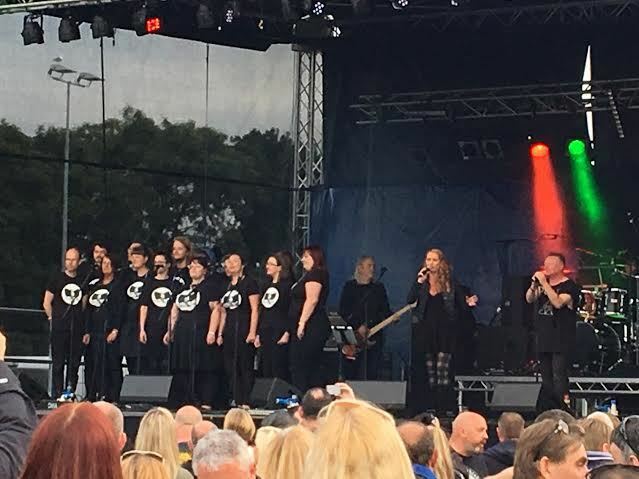 Gospel singer Phillippa Hanna and LA-based all-female rock band Dorja proved popular whilst Fife’s own Jackie Storrar appeared on stage to play two songs amid her high profile fight against cancer. Whilst Rewind might have been capturing the headlines a few miles up the road at Scone with some of the biggest bands of the 1980s performing, the PKD Festival organisers’ own band Blue Delta kept their own party going with an energetic Queen-medley and other covers ranging from Duran Duran to Kim Wilde and Blondie. After thanking everyone for their attendance and supporting the Promoting Kinship Day charities benefitting from PKD, it was then over to the ‘big boys” for the latter part of the evening. 1980s ‘My Favourite Waste of Time’ singer Owen Paul put on a decent solo set earlier including a track with his daughter on vocals. But the Glaswegian proved he was more than a one hit wonder as he returned to the stage to front XSM (Ex-Simple Minds). It’s the second year in a row the band has performed at PKD. “They asked us back – we must be ok!” he laughed. Originally formed by former Simple Minds members Derek Forbes and Brian McGee, who is Owen Paul’s older brother, XSM ran through many of Simple Minds’ crowd pleasers including Waterfront, Don’t You Forget About Me and of course the big finale Alive and Kicking. As darkness fell, and later than billed, however, it was the moment most had been waiting for – the headline slot by 1990s indie band Space. And what a finale! It’s seven years since Space frontman Tommy Scott was the victim of a hoax email purporting that he had died of heart failure. Eleven years after the band split before reforming in 2011 with a new line-up, the Scousers nailed it with a set featuring all the old hits from the 1996 Spiders album including Neighbourhood, Mister Psycho and Female of the Species. Highlights from the follow-up Tin Planet album included Avenging Angels, The Ballad of Tom Jones and a pumping version of Disco Dolly. There was even the surreal experience of watching Scott serenade a blow up doll whilst swigging from a bottle. It was a throw-back to a hazy memory I had of watching the band at T in the Park in the late 1990s. The set closed with a rocking version of Me & You Vs the World. “Thank you. You’ve been great. Enjoy the rest of your lives!” the frontman declared as many of the jubilant crowd who’d stayed behind realised they might be about to miss the last train home – and made a run for it!